Bodu Beru – the beat of a nation! Interview with Harubee – Maldives biggest Bodu Beru Band! Bodu beru, literally meaning “big drum”, is one of the oldest surviving aspects of Dhivehi culture and is a popular tourist attraction for those visiting the Maldives. It is a tradition thought to have brought to the islands by African slaves who travelled with their masters from the Arabian Peninsula according historians. It is widely believed that these people and their magnificent beats settled in the Maldives in the 18th century. They wanted to remain close to their culture so passed down their drumming knowledge. Now, today these enthralling drums beat out the very pulse of the islands, hailing back to their African ancestry. The beat is hammered out with bare hands on a goatskin drum of traditional design. Sometimes Stingray skin is used. The tempo starts slow and builds up into a crescendo and this intensity continues before reaching an abrupt end. During the music, performers do a splendid dance. 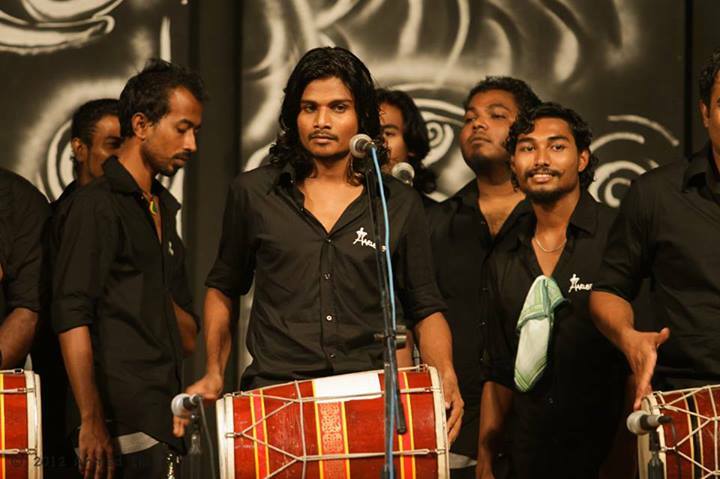 Ahmed Athif, known as Arthu is a member of 24-piece band that is Harbee. He is the grandson of the legendary musician and Bodu Beru player “Mureedhube” who was revered in the Maldives up until his death at the age of 106! “It feels so great to be part of the most popular bodu beru group in whole of the Maldives,” Arthu said. “I started to learn bodu beru when I around eight years old my grandfather was my master in teaching bodu beru. I learned so many styles of various kinds of beats from him. Every Maldivian knew my grandfather. He even got the President’s National Award. The group has been around for almost 15 years but officially came to be known as Harubee after their 2005 Dubai Shopping Festival performance, that brought them fame. Since then, Harubee has gone on to perform at tourism expos, various major events at resorts. They have appeared on the National Geographic Channel and the BBC in addition to performing alongside major local artists at live events. Harubee won the MNBC Bodu Beru Challenge 2010 and then retained the title the very next year. Harubee have enjoyed worldwide tours to India in 2006 and China the same year plus 2010. They have also played live in Colombo in Sri Lanka, Miss France , Yellow Pages Show, Help Pakistan Show and The 7 Wonders Show. In 2011 they performed at home for the Help Japan show, Sounds of Maldives , MMRA for the Blind , Tiny hearts of the Maldives , Independence Day show, and then abroad for Harubee live in Sri Lanka and last year they played at the Drums Festival in Malaysia. All the members juggle their engagements around full time work. Mandey is the main vocalist, while Shina, Puchu, Naube, and Shamru are the four main drummers. The rest of the band’s 24 members sing backing vocals and dance. The line up changes depending on who can get time off work for a performance. The actual word “Harubee” relates to the traditional greeting of the sultan. During Eid, citizens would march with trumpets and big drums in a ceremony called “Harubee Ah Vadaigathun”. Nowadays bodu beru is always popular at parties and weddings but mostly on eid and circumcision or “hithaany”. Many of the songs circulating around the bodu beru scene are so old that their origins are lost entirely. Harubee has revamped the musical style and made “bodu beru cool again”, not just something your grandparents did. There are various styles of bodu beru; from baburu , nala , kaashimajaa, hedhi-beru or taki and zamaani. 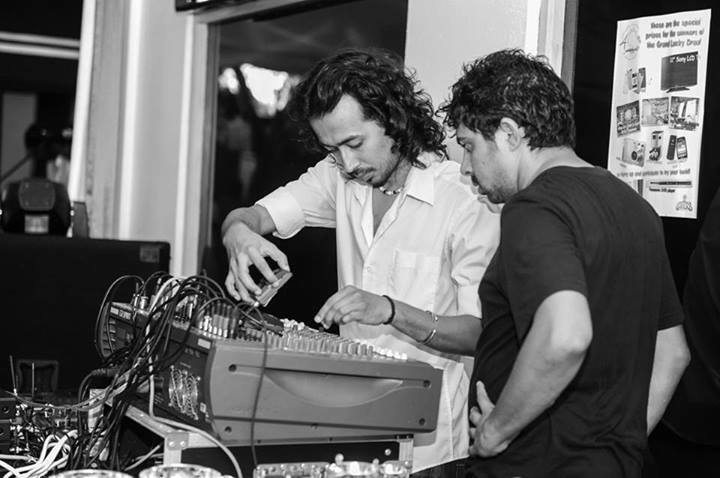 Harubee is currently working on a new album as the group continues to bring bodu beru to the mainstream. 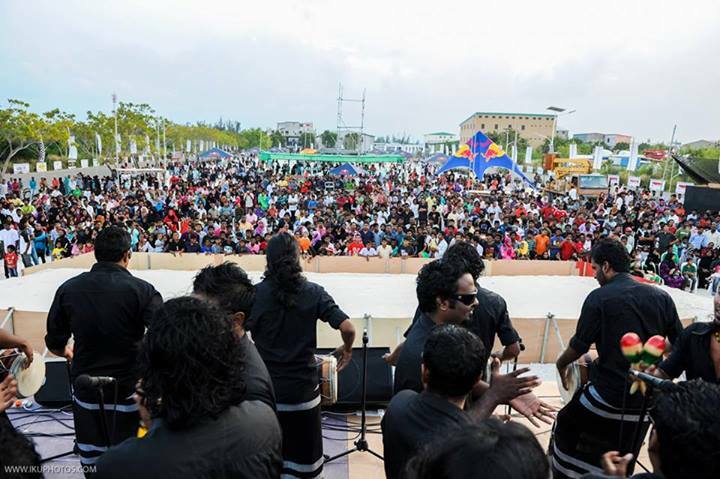 Last month the group played to a huge crowd in Raalugandu during the annual Dhiraagu sponsored Eid show. Arthu says that Bodu Beru could easily be exported and it is easy to learn, if you have the right attitude. Previous Backpack Maldives promotes “AAA” Tours – Four idyllic islands in 8 days!